Mormon Newsroom © All rights reserved. Much has been made of the Tax Cuts and Jobs Act (TCJA) that went into effect at the beginning of 2018, and a good bit of that buzz surrounded the fate of various tax credits and deductions. The Child Tax Credit survived and was actually improved to the benefit of taxpayers. Less talk was given to the fact that a whole new dependent-related tax credit, the Family Tax Credit, was created under the terms of the TCJA. This credit also helps a lot of taxpayers who would otherwise be left out in the cold. Unfortunately, it's only in place while the TCJA is in effect—from 2018 through 2025—unless Congress steps in to reinstate it when it expires. The Child Tax Credit only covers child dependents up through the age of 16. After that, the Family Tax Credit kicks in to help with your children up to age 18 or 23 if they are still in school. You can’t claim the Child Tax Credit for these dependents, but you can claim the Family Tax Credit for them subject to certain rules. Your dependent doesn’t even have to be your child for purposes of this credit. The Family Tax Credit also covers your parents, stepparents, grandparents, siblings, aunts, uncles, and in-laws. You get where this is going. 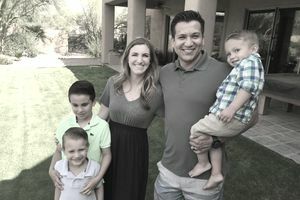 The word “family” is the deciding term, and it’s defined loosely when it comes to qualifying for the Family Tax Credit. Someone who meets all the qualifying rules might squeak in under the Credit’s terms and manage to qualify even if she’s not related to you by blood or law. The new credit applies to anyone who qualifies as your dependent. This can range from your child to your sister-in-law and beyond. Can Your Dependent Earn Income? It can’t be that easy, can it? Of course not. Claiming any of these dependents for purposes of the Family Tax Credit depends on other rules, too, and one of them concerns your dependent’s income. This is where qualifying becomes a bit complicated. The Family Tax Credit was originally written to provide that your dependent could not have gross income in excess of the dependent exemption amount for that year. However, the TCJA simultaneously eliminated that exemption for years 2018 through 2025, so the current restriction is income of as high as $4,150 depending on the situation. Does this mean that your qualifying dependent can’t earn any income? Many pundits were squawking that this would be the case, but it’s not. Section 151(d)(5)(B) of the IRC retains the exemption amount for purposes of the Child Tax Credit and the new Family Tax Credit. And the amount remains indexed for inflation, which means it can be expected to increase periodically to keep up with the economy. The IRS announced in October 2017, before the passage of the TCJA, that the exemption amount for 2018 would be adjusted upward to $4,150. But this was calculated using the traditional consumer price index (CPI) to gauge the rate of inflation, and the TCJA made a change to this rule as well. Currently, inflation adjustments in the tax code are based on the chained CPI under the terms of the TCJA, which is marginally different from the traditional CPI and usually indicates a lower inflation rate. So, yes, your dependent can still earn income up to the amount of the dependent exemption, but that $4,150 figure isn’t carved in stone. For planning purposes, you’re probably safe if you calculate based on about $4,000, however, because any change shouldn’t be very significant. How Much Income Can You Earn and Still Qualify? Your income counts, too. Like the Child Tax Credit, you can’t claim the Family Tax Credit if you earn too much, but the TCJA ramps up these caps significantly. Both credits are now available for incomes up to $400,000 if you’re married filing jointly or $200,000 for all other taxpayers. Beyond these thresholds, the amount of the credit you can claim begins phasing out or decreasing. These limits used to be $110,000 and $75,000 before the TCJA went into effect. Even if your dependent earns less than $4,150 or so in 2018, he still might not qualify because a few other requirements exist as well. First, your dependent must have received more than half his financial support from you over the course of the tax year. He might or might not have to live with you throughout the year as well. It depends on his degree of relation to you. The tax code exempts some relatives from this rule, such as your parents—provided that you provide more than half their support while they’re living elsewhere. Your dependent must also be a U.S. citizen, a U.S. resident, or a U.S. national. He must have a valid Social Security number to qualify for the Child Tax Credit, and this is a change from 2017. But the rule for the new Family Tax Credit is a bit looser. You can claim a dependent for purposes of this credit using any tax identification number if he meets the other tests. You can’t claim the credit for your spouse if you’re married and filing a joint return, nor can you claim it for yourself. But there’s no bar against taxpayers being able to claim this credit if they’re married but filing separate returns. Unfortunately, the Family Tax Credit isn’t as beefy as the Child Tax Credit. The TCJA hiked the latter to $2,000 as of 2018, but the Family Tax Credit is only $500 for each dependent. Still, that’s a lot better than zero if your child turned 17 during the tax year. It’s not a refundable credit, either, so the best it can do is reduce or eliminate your tax bill. It’s subtracted directly from whatever you owe the IRS, but the IRS won’t be sending you a check if there’s anything left over.